Here is a scar that is 5 days post-op. The patient had a strip procedure in the summer of 2002. After being totally dissatisfied with the unsightly strip scar, the patient opted to move forward with grafting the scar via CIT. 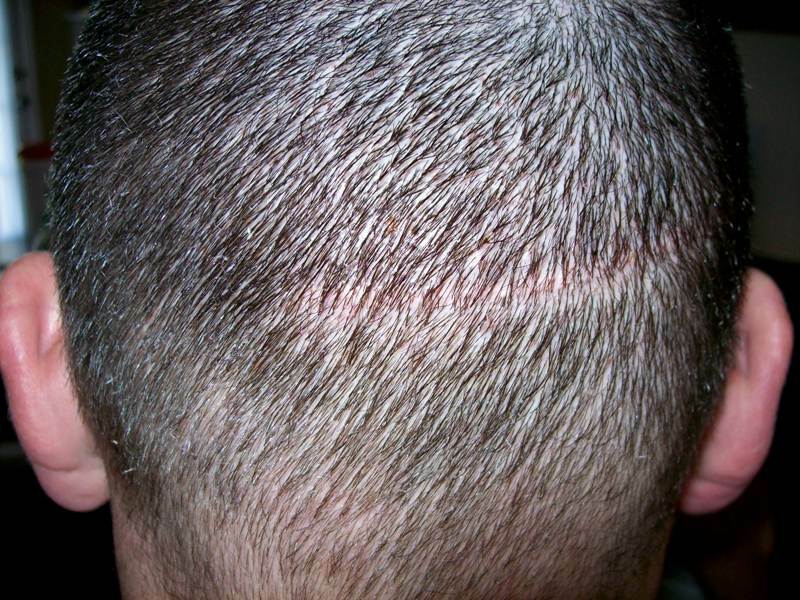 Just last week, Dr. Cole transferred approximately 200 CIT scalp grafts into this patient’s 11cm x 3mm scar. Many patients are not aware of the options to repair strip scars. They are under the impression that a second strip procedure is necessary to improve the appearance of the pre-existing strip (linear) scar. Understanding that hair loss can be a progressive condition for many younger patients, we choose to encourage younger patients that CIT is much less invasive on the donor area that strip (FUT). We sincerely look forward to a positive result on this patient’s case. Stay tuned for frequent updates. » grafts into this patient’s 11cm x 3mm scar. » improve the appearance of the pre-existing strip (linear) scar. » less invasive on the donor area that strip (FUT). » We sincerely look forward to a positive result on this patient’s case. » » grafts into this patient’s 11cm x 3mm scar. » » improve the appearance of the pre-existing strip (linear) scar. » » less invasive on the donor area that strip (FUT). » » We sincerely look forward to a positive result on this patient’s case. » » Stay tuned to www.forhair.com for frequent updates. » Where is the pic? Check again, it should be there now. Looks like he will get a nice result. Thanks for posting yet another example of what results from strip surgery. » Looks like he will get a nice result. » Thanks for posting yet another example of what results from strip surgery. yeah. Thanks. He will probably be able to get it down to a 2 guard. » » Looks like he will get a nice result. » yeah. Thanks. He will probably be able to get it down to a 2 guard. What are the options if he wanted to do something else to improve the appearence of the wound? How much better would it be by revision? Looks great. Strip doctors should start offering this type of touch up to all of their strip patients 6 months to a year after their surgery. Sure would make people more comfortable with the scar knowing that it is going to be repaired somewhat. » to be repaired somewhat. We prefer to graft strip scars rather than revise them. Patients are left with a linear scar that should be thinner but will remain visible. The scars are usually about 50% better in appearence after the revision but may still stretch wider over time. Some scars are so wide that revisions are viable solutions depending on the patients goals. Grafting the scar is less invasive and usually is more effective in reducing the appearence of strip scars. A CIT grafting procedure may require patients to have more than one session to treat the scar. After the scar is grafted, it may become pinkish in color then turn white months later. The approach is to transplant a lower number of grafts to help ensure that the blood supply for the grafts is adequate. Both methods can help the patient improve the appearence of the strip scar.